‘component’: means a device as defined in Article 2 of Directive 70/156/EEC. if the relevant requirements set out in Annexes I, IV, V and VI to this Directive are satisfied. 1. Member States shall adopt and publish the laws, regulations are administrative provisions necessary to comply with this Directive within 18 months of the date of its adoption. They shall forthwith inform the Commission thereof. From the abovementioned date, Member States may no longer prohibit the initial entry into service of vehicles or the sale or use of components complying with this Directive. They shall apply these provisions 48 months following the date of adoption of this Directive. 2. When Member States adopt these measures, they shall contain a reference to this Directive or shall be accompanied by such reference on the occasion of their official publication. The method of making such reference shall be laid down by Member States. Done at Luxembourg, 24 October 1995. (1) OJ No C 154, 19. 6. 1992, p. 4. (2) OJ No C 332, 16. 12. 1992, p. 12. (3) Opinion of the European Parliament of 29 October 1992 (OJ No C 305, 23. 11. 1992, p. 109), Council common position of 8 December 1994 (OJ No C 384, 31. 12. 1994, p. 1) and Decision of the European Parliament of 15 June 1995 (OJ No C 166, 3. 7. 1995). (4) OJ No L 42, 23. 2. 1970, p. 1. Directive as last amended by Commission Directive 93/81/EEC (OJ No L 264, 23. 10. 1993, p. 49). (5) OJ No L 267, 19. 10. 1977, p. 1. Directive last amended by Commission Directive 90/630/EEC (OJ No L 341, 6. 12. 1990, p. 20). This Directive applies to the burning behaviour (ignitability, burning rate and melting behaviour) of interior materials used in vehicles of category M3 carrying more than 22 passengers, not being designed for standing passengers and urban use (city buses). Member States which, prior to the date mentioned in Article 3 (1), third subparagraph of the Directive, had legislation applying to vehicle categories other than that mentioned above may continue to apply that legislation provided that they accept type-approval for other vehicle categories which comply with the provisions of this Directive. ‘Approval of a vehicle’ means the approval of a vehicle type such as defined in point 2.2 with regard to the burning behaviour of the interior components used in the passenger compartment. The devices such as materials, seats, curtains, separation walls, etc. used in the passenger compartment. The mass of the devices used, in so far as they have an effect on the performance prescribed in this Directive. The optional arrangements or fittings in so far as they have no detrimental effect on the performance prescribed in this Directive. ‘Approval of a component’ means an approval for devices, such as materials, seats, curtains, separation walls, etc. the base material(s) (e.g. wool, plastic, rubber, blended materials). the intended use (seat upholstery, roof lining, etc.). the number of layers in the case of composite materials. other characteristics in so far as they have an appreciable effect on the performance prescribed in this Directive. at the opposite side of the longitudinal vertical median plane of the vehicle, the front bulkhead. ‘Seat’ means a structure which may or may not be integral with the vehicle structure, complete with trim, intended to seat one adult person. The term covers both an individual seat or part of a bench seat intended to seat one adult person. ‘Group of seats’ means either a bench-type seat, or seats which are separate but side by side (i. e. with the foremost anchorages of one seat in line with or forward of the rearmost anchorages and in line with or behind the foremost anchorages of another seat) and which accommodate one or more seated adult persons. ‘Bench seat’ means a structure complete with trim, intended to seat more than one adult person. ‘Burning rate’ means the quotient of the burnt distance measured according to Annex IV and/or VI to this Directive and the time taken to burn this distance. It is expressed in millimetres per minute. ‘Composite material’ means a material composed of several layers of similar or different materials intimately held together at their surfaces by cementing, bonding, cladding, welding, etc. When different materials are connected together intermittently (for example, by sewing, high-frequency welting, riveting), such materials shall not be considered as composite materials. ‘Exposed face’ means the side of a material which is facing towards the passenger compartment when the material is mounted in the vehicle. ‘Upholstery’ means the combination of interior padding and surface finish material which together constitute the cushioning of the seat frame. ‘Interior lining(s)’ means material(s) that (together) constitute(s) the surface finish and substrate of a roof, wall or floor. The application for EEC type-approval pursuant to Article 3 (4) of Directive 70/156/EEC of a vehicle type with regard to the burning behaviour of the materials used in the passenger compartment shall be submitted by the vehicle manufacturer. 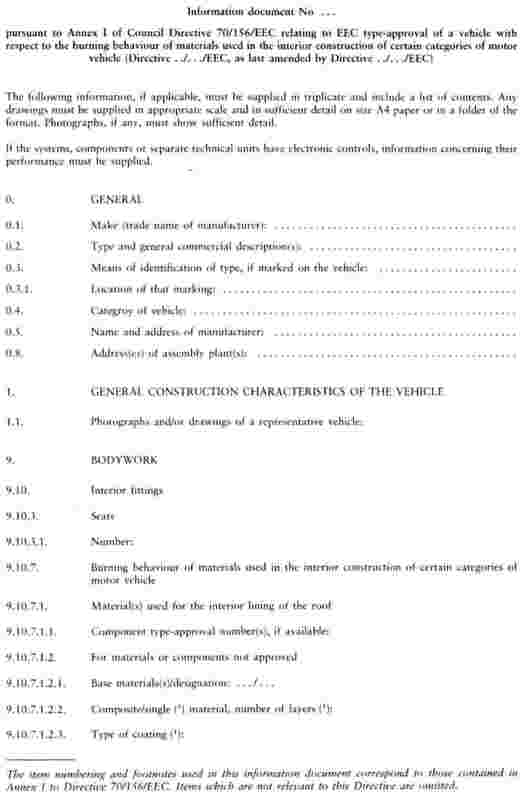 A model of the information document is given in Annex II, Appendix 1.
a vehicle representative of the type to be approved. 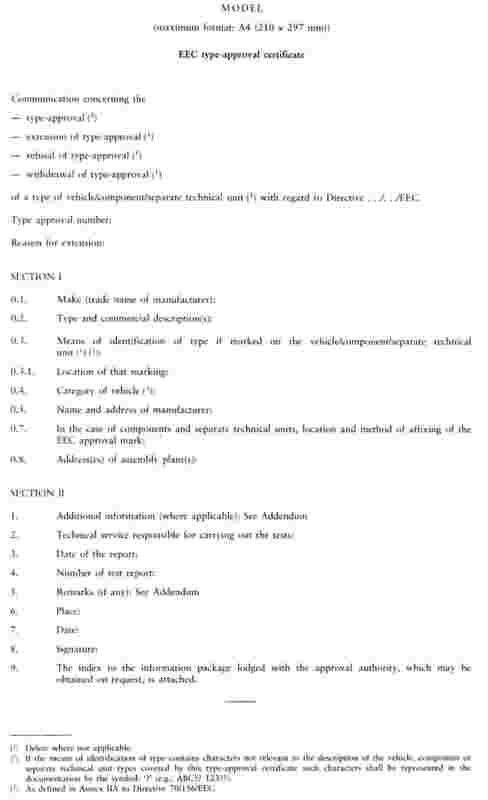 The application of EEC component type-approval pursuant to Article 3 (4) of Directive 70/156/EEC for a type of interior material with regard to its burning behaviour shall be submitted by the manufacturer. 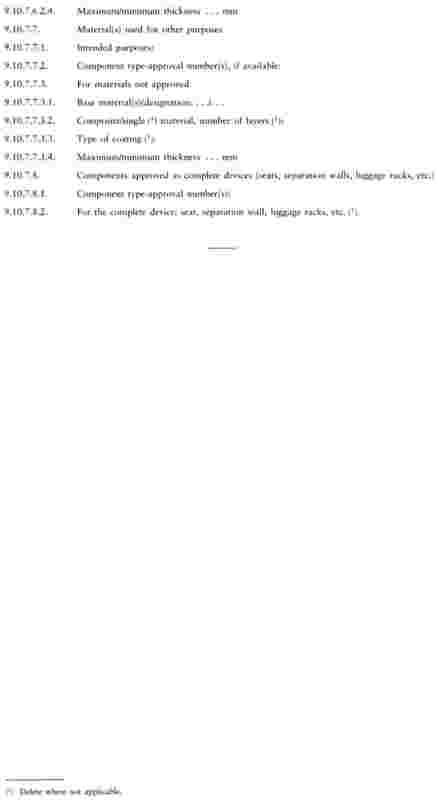 A model for the information document is given in Annex II, Appendix 2.
for devices such as seats, curtains, separation walls, etc., the samples specified in 4.3.1 plus one complete device as mentioned above. If the relevant requirements are satisfied, EEC type-approval pursuant to Article 4 (3) and, if applicable, 4 (4), of Directive 70/156/EEC shall be granted. Annex III, Appendix 1 for applications referred to in 3.1. Annex III, Appendix 2 for applications referred to in 4.1. 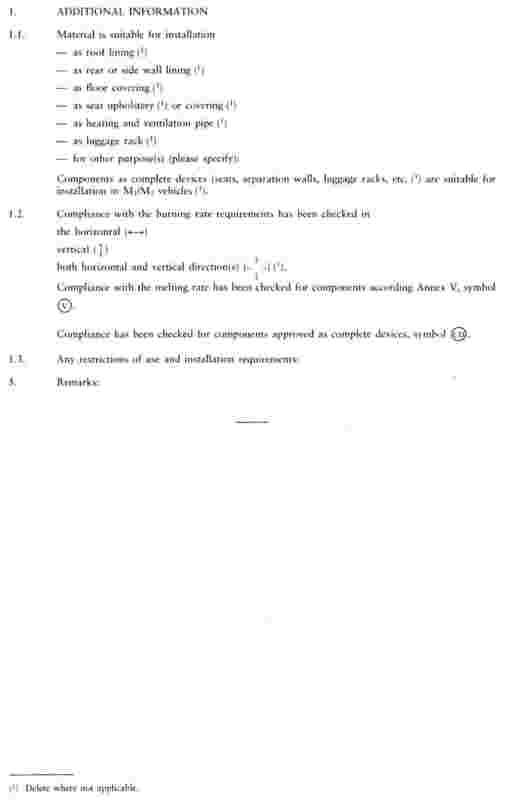 An approval number in accordance with Annex VII to Directive 70/156/EEC shall be assigned to each type of vehicle and to each type of component approved. The same Member State shall not assign the same number to another type of vehicle or to another type of component. the symbol indicating that the component has been approved according to its melting behaviour (Annex V) and /or the symbol indicating that the component has been approved as a complete device, such as seats, separation walls, luggage racks, etc. Where the seat has been approved as a component or where the cushion and the back of a seat or bench seat are covered with the same material, it is sufficient if the mark appears only once per seat or bench seat. The mark must be affixed to the material in such a way as to be clearly legible and indelible even if the material is installed in a vehicle. A model for the EEC component type-approval mark is shown in the Appendix of this Annex. The interior materials of the passenger compartment used in the vehicle to be type-approved shall undergo one or more of the tests mentioned in Annexes IV, V and VI. material(s) used for the light fittings. Furthermore, one sample shall be submitted to the technical service for future reference purposes. The result of the test shall be considered satisfactory if, taking the worst test results into account, the horizontal burning rate is not more than 100 mm/minute or if the flame extinguishes before reaching the last measuring point. material(s) used for the lights situated in the luggage-racks and/or roof. Furthermore, one sample shall be submitted to the technical services for future reference purposes. The result of the test shall be considered satisfactory if, taking the worst test results into account, no drop is formed which ignites the cotton wool. Three samples in the case of an isotropic material, or six samples in the case of a non-isotropic material, of the material(s) used for the curtains and blinds (and/or other hanging materials) shall undergo the test described in Annex VI. The result of the test shall be considered satisfactory if, taking the worst test results into account, the vertical burning rate is not more than 100 mm/minute. 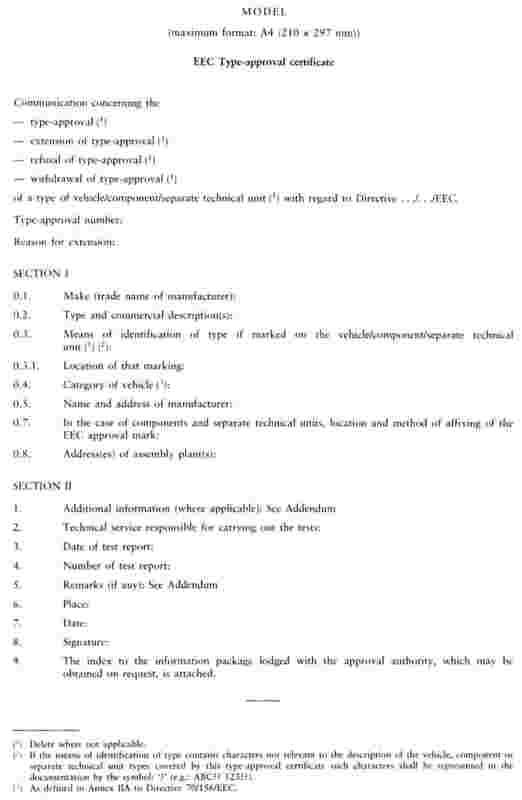 elements for which it is not possible to extract a sample in the prescribed dimensions as specified in paragraph 3.1 of Annex IV, paragraph 3 of Annex V and paragraph 3.1 of Annex VI. In the case of modifications of the type approved pursuant to this Directive, the provisions of Article 5 of Directive 70/156/EEC shall apply. Measures to ensure the conformity of production shall be taken in accordance with the provisions laid down in Article 10 of Directive 70/156/EEC. The materials and/or equipment used in the passenger compartment and/or in devices approved as components shall be so installed as to minimize the risk of flame development and flame propagation. Such interior materials and/or equipment shall only be installed in accordance with their intended purposes and the test(s) which they have undergone (see 7.2, 7.3 and 7.4), especially in relation to their burning and melting behaviour (horizontal/vertical direction). Any adhesive agent used to affix the interior material to its supporting structure shall not, as far as possible, exacerbate the burning behaviour of the material. The above component type-approval mark shows that the interior material in question has been approved in Germany (el) pursuant to this Directive (00) under the approval number 2439. The first two digits indicate that this component was approved according to the original form of this Directive. The additional symbol indicates that this type of material has been approved according to its horizontal and vertical burning rate. The symbols and/or indicate an approval according to Annex V and/or an approval as a complete device such as seats, separation walls, etc. The additional symbols are only used if applicable. 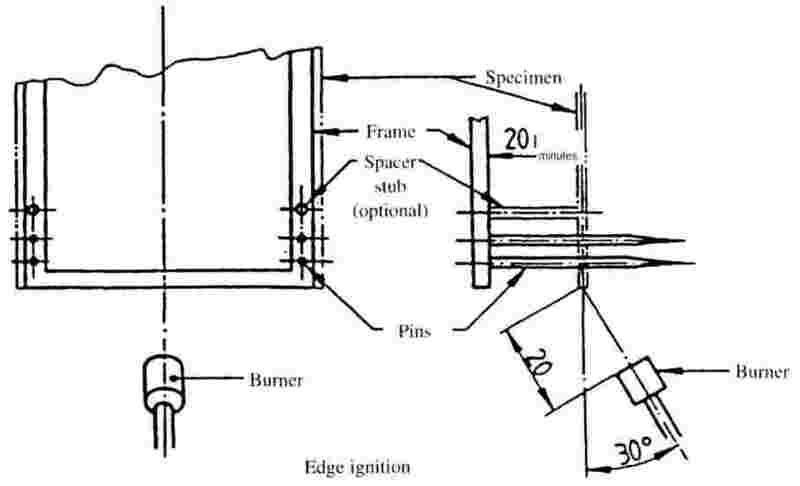 A sample is held horizontally in a U-shaped holder and is exposed to the action of a defined low-energy flame for 15 seconds in a combustion chamber, the flame acting on the free end of the sample. The test determines if and when the flame extinguishes or the time in which the flame passes a measured distance. Combustion chamber (figure 1), preferably of stainless steel and having the dimensions given in figure 2. The front of the chamber contains a flame-resistant observation window, which may cover the front and which can be constructed as an access panel. The bottom of the chamber has vent holes, and the top has a vent slot all around. The combustion chamber is placed on four feet, 10 mm high. 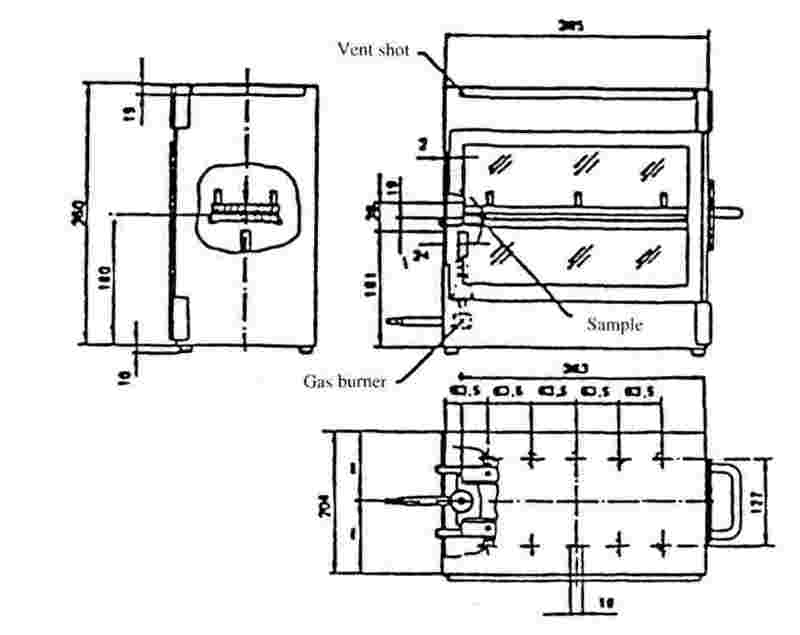 The chamber may have a hole at one end for the introduction of the sample holder containing the sample; in the opposite end, a hole is provided for the gas line. Melted material is caught in a pan (see figure 3) which is placed on the bottom of the chamber between vent holes without covering any vent hole area. Sample holder, consisting of two U-shaped metal plates or frames of corrosion-proof material. 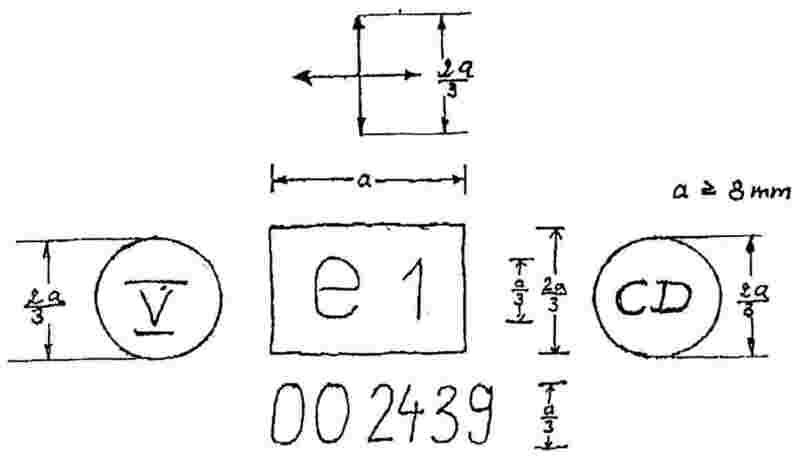 Dimensions are given in figure 4. The lower plate is equipped with pins, the upper one with corresponding holes in order to ensure a consistent holding of the sample. The pins also serve as the measuring points at the beginning and end of the burning distance. 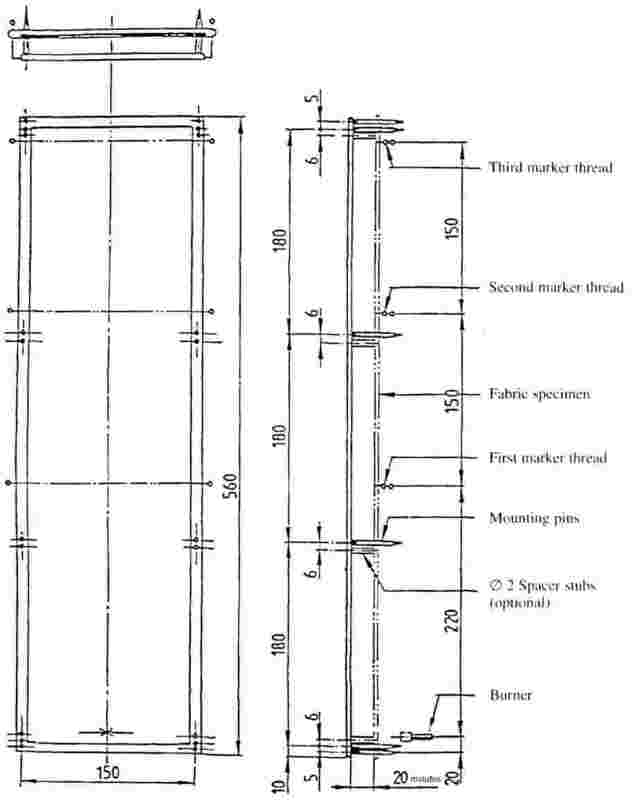 A support shall be provided in the form of 0,25 mm diameter heat resistant wires spanning the frame at 25 mm intervals over the bottom U-shaped frame (see figure 5). The plane of the lower side of samples shall be 178 mm above the floor plate. 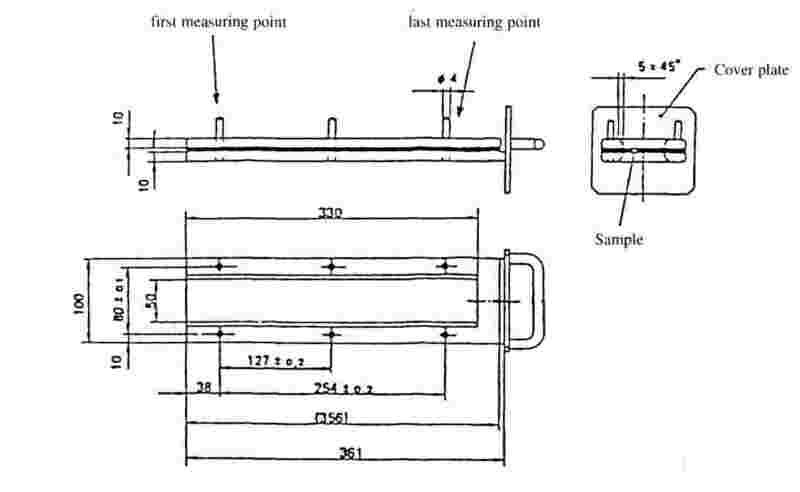 The distance of the front edge of the sample holder from the end of the chamber shall be 22 mm; the distance of the longitudinal sides of the sample holder from the sides of the chamber shall be 50 mm (all inside dimensions). (See figures 1 and 2). Gas burner. The small ignition source is provided by a Bunsen burner having an inside diameter of 9,5 ± 0,5 mm. It is located in the test cabinet so that the centre of its nozzle is 1 9 mm below the centre of the bottom edge of the open end of the sample (see figure 2). Test gas. The gas supplied to the burner shall have a calorific value near 38 MJ/m3 (for example natural gas). Metal comb, at least 110 mm in length, with seven to eight smooth rounded teeth per 25 mm. Stop-watch, accurate to 0,5 seconds. Fume cupboard. The combustion chamber may be placed in a fume cupboard assembly provided that the internal volume is at least 20 times, but not more than 110 times, greater than the volume of the combustion chamber and provided that no single height, width, or length dimension of the fume cupboard is greater than 21/2 times either of the other two dimensions. Before the test, the vertical velocity of the air through the fume cupboard shall be measured 100 mm in front of and behind the final position where the combustion chamber will be located. It shall be between 0,10 and 0,30 m/s in order to avoid possible discomfort, by combustion products, to the operator. It is possible to use a fume cupboard with a natural ventilation and an appropriate air velocity. 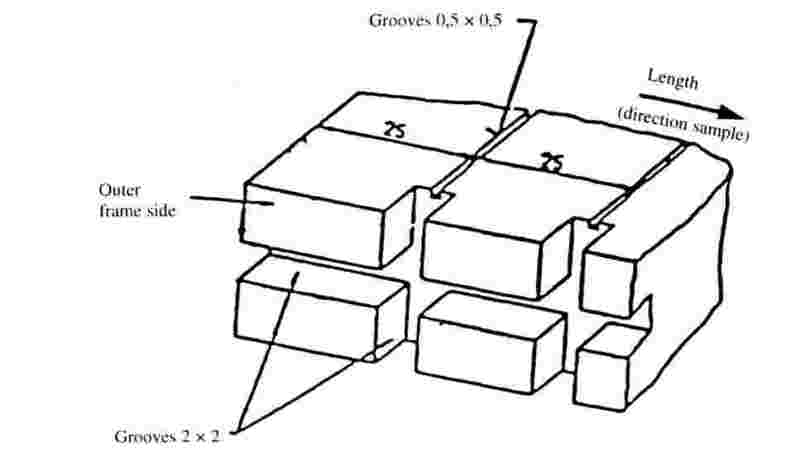 The shape and dimensions of samples are given in figure 6. The thickness of the sample corresponds to the thickness of the product to be tested. It shall not be more than 13 mm. When taking the sample permits, the sample shall have a constant section over its entire length. for samples having a width of 60 to 100 mm, the length shall be at least 138 mm. In this case the potential burning distance corresponds to the length of the sample, the measurement starting at the first measuring point. The samples shall be taken from the material under test. In materials having different burning rates in different material directions, each direction has to be tested. The samples are to be taken and placed in the test apparatus so that the highest burning rate will be measured. When the material is supplied in widths, a length of at least 500 mm shall be cut covering the entire width. From this the samples shall be taken so as to be at least 100 mm from the material edge and equidistant from each other. Samples shall be taken in the same way from finished products, when the shape of the product permits. When the thickness of the product is more than 13 mm, it shall be reduced to 13 mm by a mechanical process applied to the side which does not face the occupant compartment. If it is impossible, the test shall be carried out, in accordance with the Technical Service, on the initial width of the material which shall be mentioned in the test report. 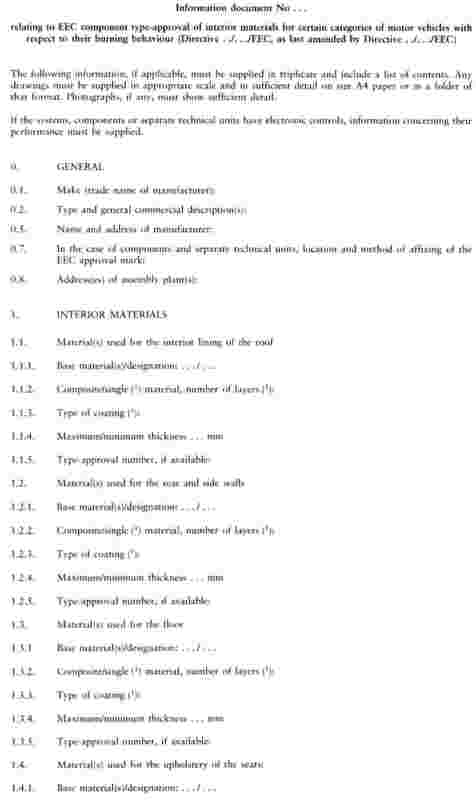 Composite materials (see point 2.10 of Annex I) shall be tested as if they were of uniform construction. In the case of materials made of superimposed layers of different composition which are not composite materials, all the layers of material included within a depth of 13 mm from the surface facing towards the passenger compartment shall be tested individually. The samples shall be conditioned for at least 24 hours but not more than 7 days at a temperature of 23 ± 2oC and a relative humidity of 50 ± 5 % and shall be maintained under these conditions until immediately prior to testing. Place samples with napped or tufted surfaces on a flat surface and comb twice against the nap using the comb ( 2.5). Place the sample in the sample holder (2.2) so that the exposed side will be downwards to the flame. Adjust the gas flame to a height of 38 mm using the mark in the chamber, the air intake of the burner being closed. Before starting the first test, the flame shall burn at least for 1 min for stabilization. Push the sample-holder into the combustion chamber so that the end of the sample is exposed to the flame, and after 15 seconds cut off the gas flow. The measurement of the burning time starts at the moment when the foot of the flame passes the first measuring point. Observe the flame propagation on the side burning faster than the other (upper or lower side). Measurement of burning time is completed when the flame has come to the last measuring point or when the flame extinguishes before coming to the last measuring point. If the flame does not reach the last measuring point, measure the burnt distance up to the point where the flame extinguished. Burnt distance is the decomposed part of the sample, which is destroyed on its surface or in the interior by burning. In so far as the sample does not ignite or does not continue burning after the burner has been extinguished, or when the flame extinguishes before reaching the first measuring point, so that no burning time is measured note in the test report that the burning rate is 0 mm/min. When running a series of tests or repeat tests, ensure that the combustion chamber and sample holder have a maximum temperature of 30oC before starting the next test. is the time, in seconds, to burn distance s.
(1) The burning rate (B) for each sample is only calculated in the case where the flame reaches the last measuring point or the end of the sample. 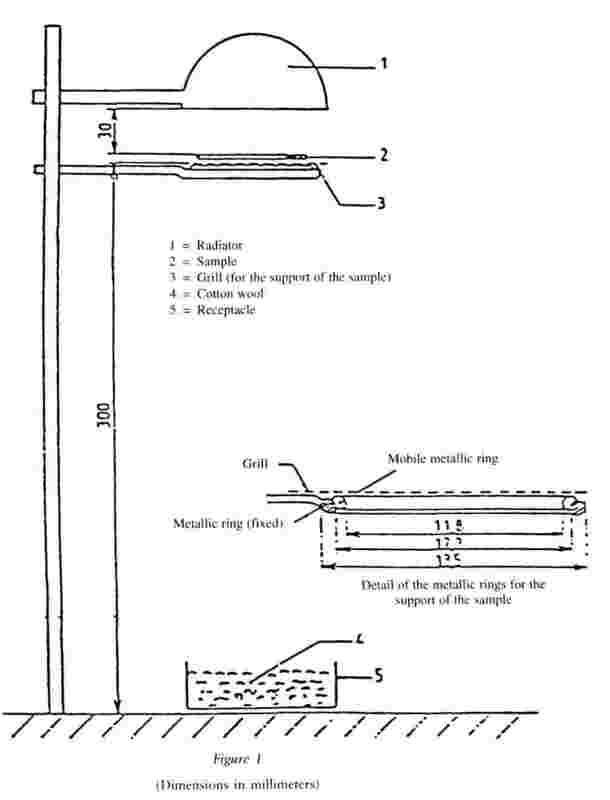 A sample is placed in a horizontal position and is exposed to an electric radiator. A receptacle is positioned under the specimen to collect the resultant drops. Some cotton wool is put in this receptacle in order to verify if any drop is flaming. a support (for the apparatus). 2.1. The source of heat is an electric radiator with a useful output of 500 W. The radiating surface must be made of a transparent quartz plate with a diameter of 100 ± 5 mm. The radiated heat from the apparatus, measured on a surface which is situated parallel to the surface of the radiator at a distance of 30 mm, shall be 3 W/cm2. For calibration of the radiator, a heat flux meter (radiometer) of the Gardon (foil) type with a design range not exceeding 10 W/cm2 shall be used. The target receiving radiation, and possibly to a small extent convection, shall be flat, circular, not more than 10 mm in diameter and coated with a durable matt black finish. The target shall be contained within a watercooled body the front face of which shall be of highly polished metal, flat, coinciding with the plane of the target and circular, with a diameter of about 25 mm. Radiation shall not pass through any window before reaching the target. The instrument shall be robust, simple to set up and use, insensitive to draughts, and stable in calibration. The instrument shall have an accuracy of within ± 3 % and a repeatability within 0,5 %. The calibration of the heat flux meter shall be checked whenever a recalibration of the radiator is carried out, by comparison with an instrument held as a reference standard and not used for any other purpose. The reference standard instrument shall be fully calibrated at yearly intervals in accordance with a national standard. The irradiance produced by the power input which the initial calibration has shown to correspond to an irradiance of 3 W/cm2 shall be frequently checked (at least once every 50 operating hours) and the apparatus shall be recalibrated if such a check reveals a deviation greater than 0,06 W/cm2. The apparatus shall be placed in an environment essentially free of air currents (not more than 0,2 m/s). Place the heat flux meter in the apparatus in the specimen position so that the target of the heat flux meter is located centrally within the radiator surface. Switch on the electricity supply and establish the power input of the controller required to produce irradiance at the centre of the radiator surface of 3 W/cm2. Adjustment to the power unit to record 3 W/cm2 should be followed by a five minute-period without further adjustment to ensure equilibrium. diameter of the steel-wire: 0,70 mm. 2.4. The receptacle shall consist of a cylindrical tube with an interior diameter of 118 mm and a depth of 12 mm. The receptacle shall be filled with cotton wool. 2.5. A vertical column shall support the items specified in paragraph 2.1, 2.3 and 2.4. The radiator is placed on top of the support in a manner such that the radiating surface is horizontal and the radiation is downwards. A lever/pedal shall be provided in the column to lift the support of the radiator slowly. It shall also be provided with a catch in order to ensure that the radiator can be brought back in its normal position. In their normal position, the axes of the radiator, the support for the sample and the receptacle must coincide. The test samples shall measure: 70 mm x 70 mm. 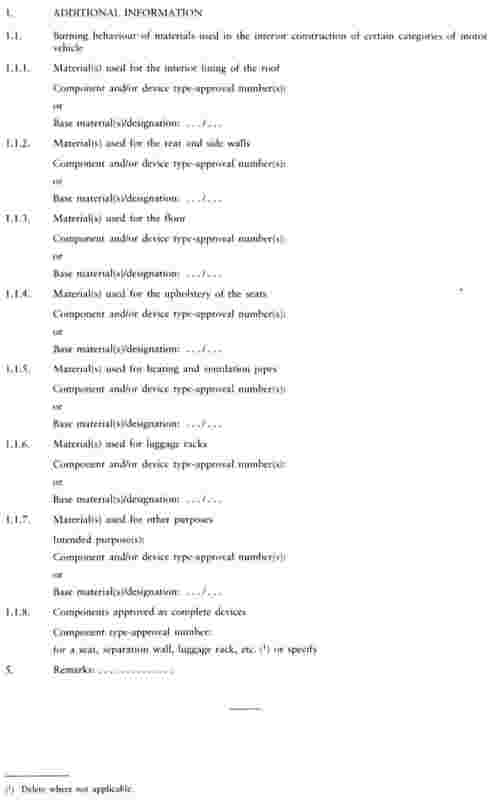 Composite materials (see 2.8 of Annex I) shall be tested as if they were of uniform construction. The total mass of the sample to be tested shall be at least 2 g. If the mass of one sample is less, a sufficient number of samples shall be added. If the two faces of the material differ, both faces must be tested, which means that eight samples are to be tested. The samples and the cotton wool shall be conditioned for at least 24 hours at a temperature 23 ± 2 o C and a relative humidity of 50 ± 5 % and shall be maintained under these conditions until immediately prior to testing. The sample is placed on the support and the latter is so positioned that the distance between the surface of the radiator and the upperside of the sample is 30 mm. The receptacle, including the cotton wool, is placed beneath the grill of the support at a distance of 300 mm. The radiator is put aside, so that it cannot radiate on the sample, and switched on. When it is on full capacity it is positioned above the sample and timing is started. If the material melts or deforms, the height of the radiator is modified to maintain the distance of 30 mm. If the material ignites, the radiator is put aside three seconds afterwards. It is brought back in position when the flame has extinguished and the same procedure is repeated as frequently as necessary during the first five minutes of the test. If the sample has extinguished (whether or not it has ignited during the first five minutes of the test) leave the radiator in position even if the sample reignites. If the material is flaming, await extinction before bringing the radiator into position again. In either case, the test must be continued for an additional five minutes. This test consists of exposing samples, held in a vertical position, to a flame and determining the speed of propagation of the flame over the material to he tested. The specimen holder shall consist of a rectangular frame 560 mm high and shall have two rigidly connected parallel rods spaced 150 mm apart on which pins shall be fitted for mounting the test specimen which is located in a plane at least 20 mm from the frame. The mounting pins shall be not greater than 2 mm in diameter and at least 27 mm long. 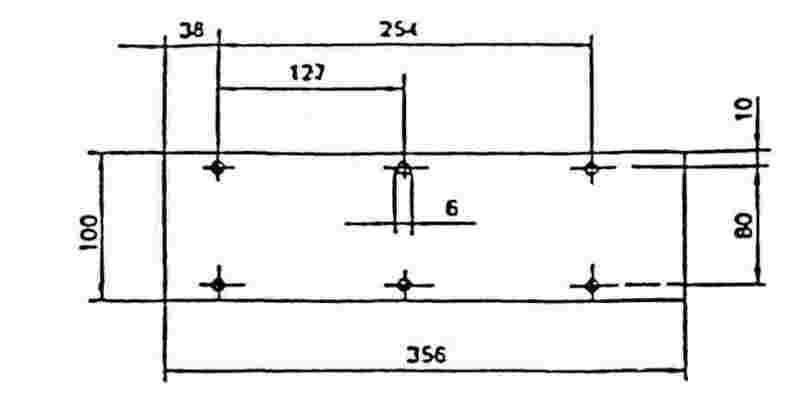 The pins shall be located on the parallel rods at locations shown in figure 1. The frame shall be fitted onto a suitable support to maintain the rods in a vertical orientation during testing. (For the purpose of locating the specimen on the pins in a plane away from the frame, spacer stubs 2 mm in diameter may be provided adjacent to the pins). The burner is described in figure 3. The gas supplied to the burner can be either commercial propane gas or commercial butane gas. The burner shall be positioned in front of, but below, the specimen such that it lies in a plane passing through the vertical centreline of the specimen and perpendicular to its face (see figure 2), such that the longitudinal axis is inclined upwards at 30 o to the vertical towards the lower edge of the specimen. The distance between the tip of the burner and the lower edge of the specimen shall be 20 mm. 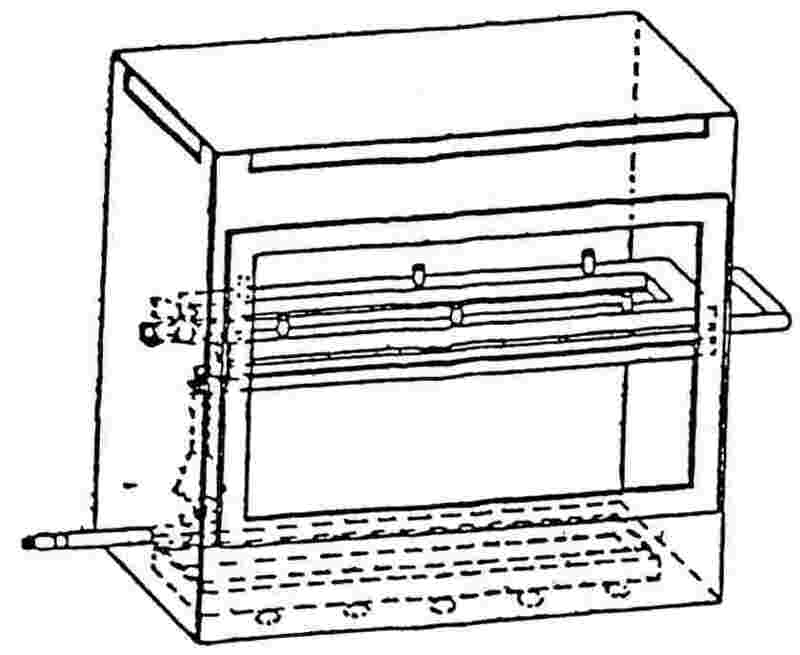 The test apparatus may be placed in a fume cupboard assembly provided that the internal volume is at least 20 times, but not more than 110 times, greater than the volume of the test apparatus and provided that no single height, width, or length dimension of the fume cupboard is greater than 2 1/2 times either of the other two dimensions. Before the test, the vertical velocity of the air through the fume cupboard shall be measured 100 mm in front of and behind the final position where the test apparatus will be located. It shall be between 0,10 and 0,30 m/s in order to avoid possible discomfort, by combustion products, to the operator. It is possible to use a fume cupboard with a natural ventilation and an appropriate air velocity. A flat rigid template made of suitable material and of a size corresponding to the size of the specimen shall be used. Holes approximately 2 mm in diameter shall be drilled in the template and positioned so that the distances between the centres of the holes correspond to the distances between the pins on the frames (see figure 1). The holes shall be located equidistant about the vertical centrelines of the template. The samples dimensions are: 560 x 170 mm. The samples shall be conditioned for at least 24 hours at a temperature of 23 ± 2 oC and a relative humidity of 50 ± 5 % and shall be maintained under these conditions until immediately prior to testing. The test shall be carried out in an atmosphere having a temperature between 10o and 30 oC and a relative humidity between 15 % and 80 %. The burner shall be preheated for 2 minutes. The flame height shall be adjusted to 40 ± 2 mm measured as the distance between the top of the burner tube and the tip of the yellow part of the flame when the burner is vertically oriented and the flame is viewed in dim light. The specimen shall be placed on the pins of the test frame, making certain that the pins pass through the points marked off from the template and that the specimen is at least 20 mm removed from the frame. The frame shall be fitted on the support so that the specimen is vertical. The marker threads shall be attached horizontally in front of the specimen at the locations shown in figure 1. At each location, a loop of thread shall be mounted so that the two segments are spaced 1 mm and 5 mm from the plane of the front of the specimen. Each loop shall be attached to a suitable timing device. Sufficient tension shall be imposed to the thread to maintain its position relative to the specimen. The flame shall be applied to the specimen for 5 seconds. Ignition shall be deemed to have occurred if flaming of the specimen continues for 5 seconds after removal of the igniting flame. If ignition does not occur, the flame shall be applied for 15 seconds to another conditioned specimen. If any result in any set of three specimens exceeds the minimum result by 50 %, another set of three specimens shall be tested for that direction or face. If one or two specimens in any set of three specimens fail to burn to the top marker thread, another set of three specimens shall be tested for that direction or face. 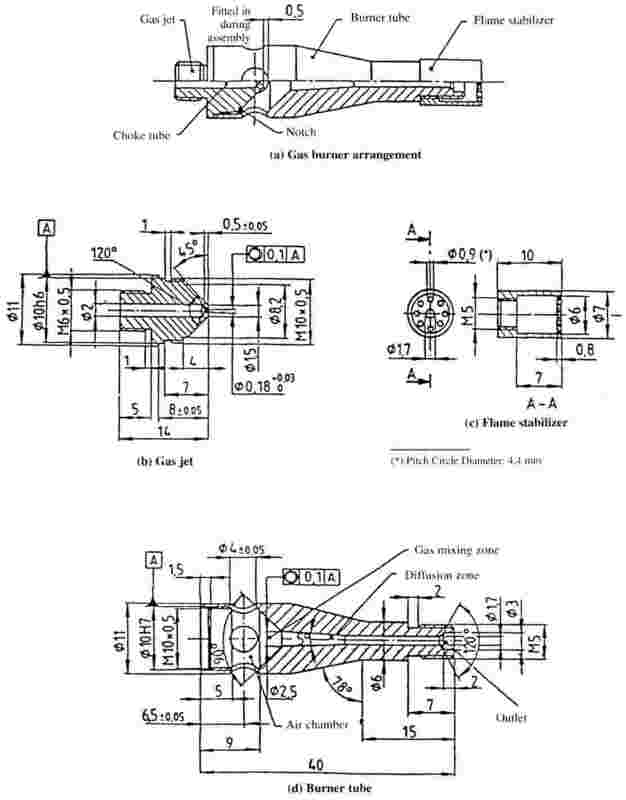 from the start of the application of the igniting flame to the severance of the third marker thread (t3). the corresponding burnt distances: d1, d2 and d3 in mm. The highest burning rate of V1, V2 and V3 shall be taken into account.